SSAATTBB, org. Originally taken from the Credo in F. Edited by Ben Byram-Wigfield. This motet is a section of a Credo in F, for four voices with string and continuo accompaniment, found in a manuscript in Dresden. Lotti lived and worked in Dresden from 1717-1719, though the work was likely written in Venice before that. For this section of the Credo, the continuo alone backs the choir; the remaining instruments are tacet, and the choir doubles to 8 parts. The excerpt's modern popularity comes from its publication in an 1860 compilation, Musica sacra, by Franz Commer. The original key signature has only one flat; E and A flats in the score have therefore been subsumed into the key signature to retain a familiarity with previous editions. The major editorial task is realising the figured bass and adjusting the figures for the revised key signature. Double barlines, cautionary accidentals, commas and fermata are editorial. Printed copies can be purchased, but the Crucifixus for 8vv is also available as a PDF for free download. 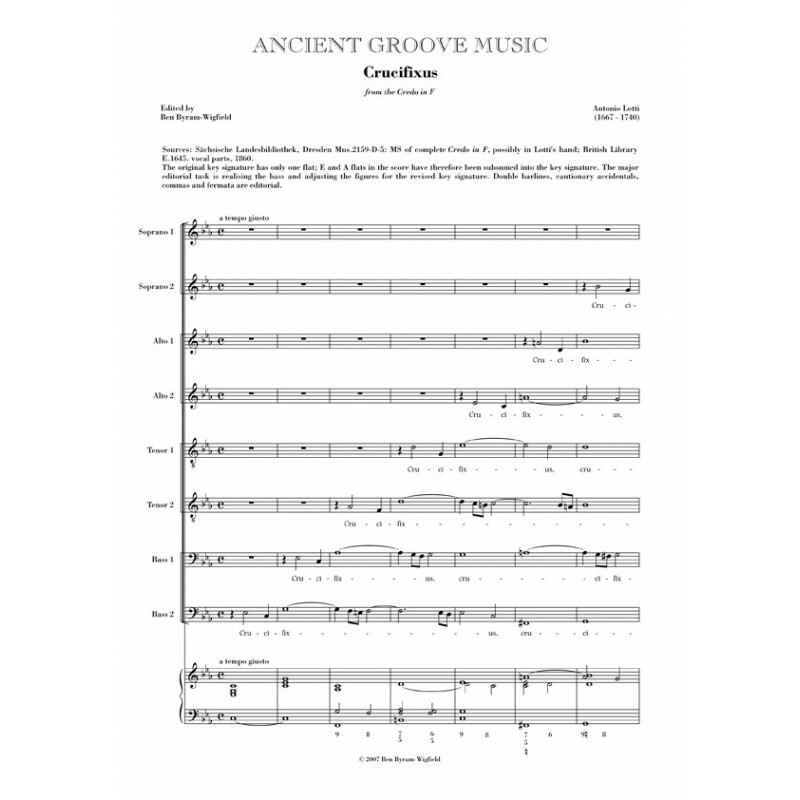 An instrumental bass continuo part is available for purchase upon request. 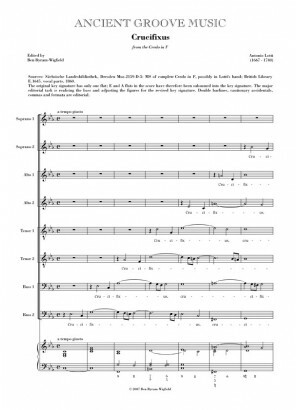 The complete Credo in F for choir with strings, and the complete mass (Missa Sancti Christophori) are also now available.